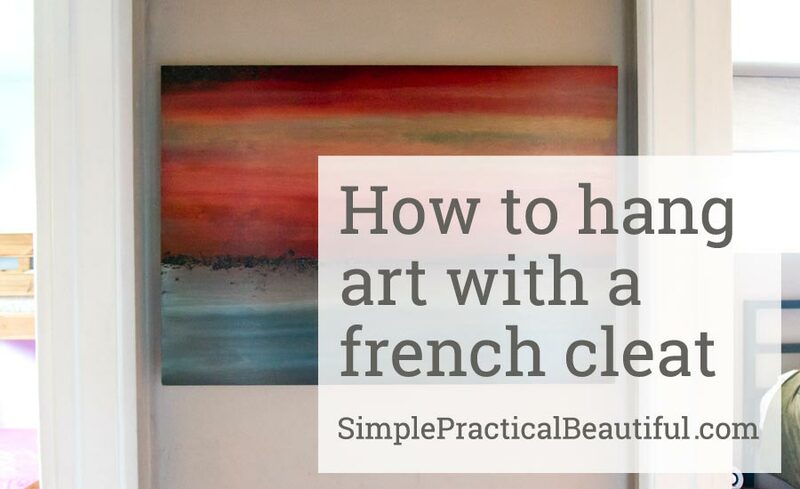 A french cleat is a great way to hang artwork. You can buy one that’s metal or make one out of wood. 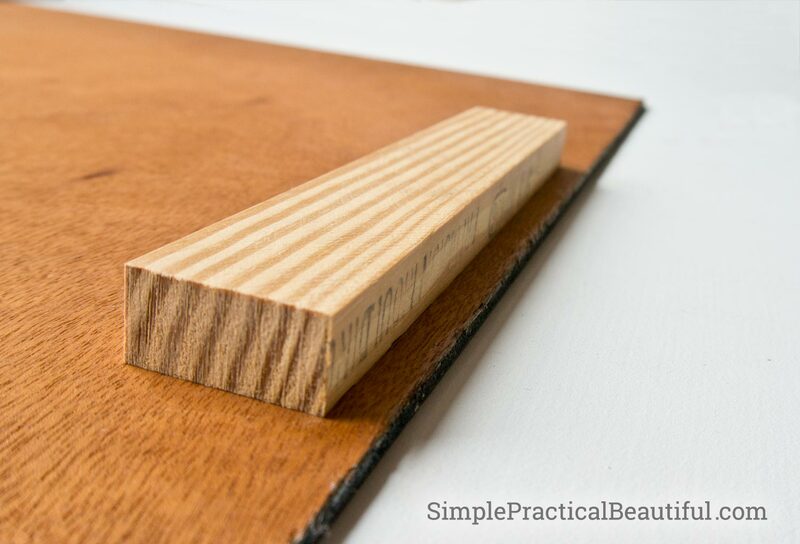 Here’s how to make a french cleat out of wood. After last weeks post about the value of original art, I’d like to share a piece I have hanging in my home. 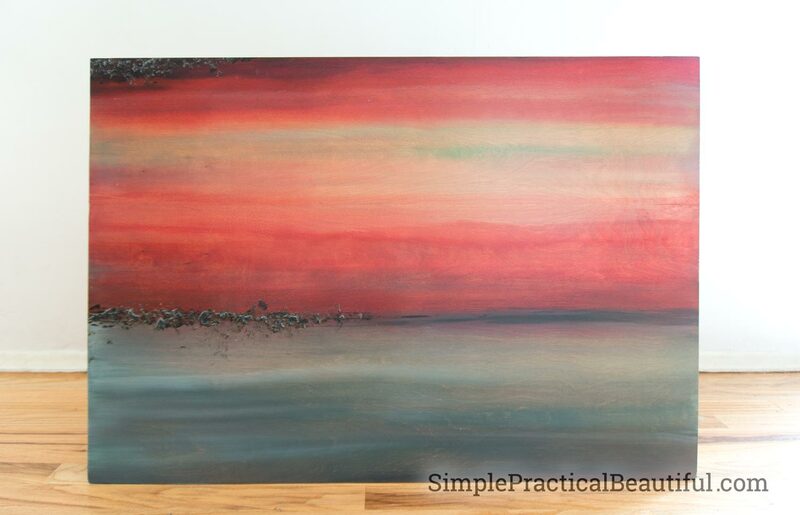 My artwork is a seascape, and it’s paint on wood created by my uncle, William Alexander. I love the textures in my painting. 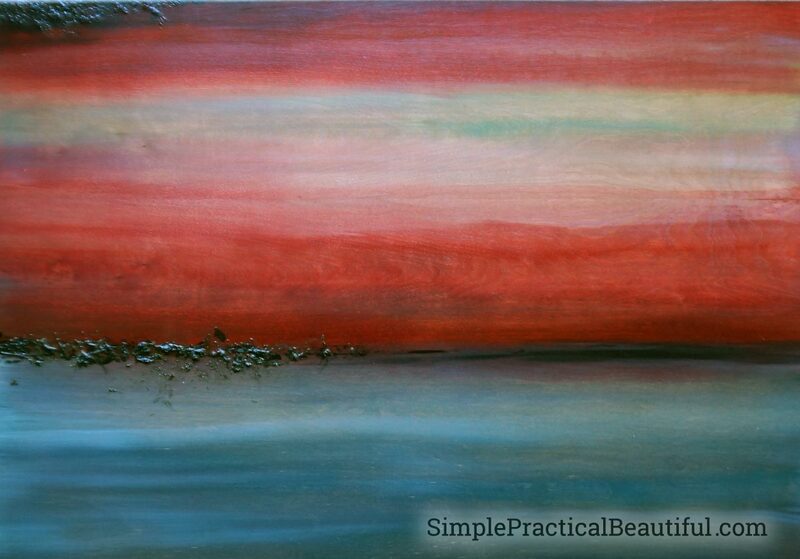 The wood grain shows through the paint giving the ocean and sky more depth and movement. I especially love the texture of the thick paint making the clouds and breakwater. Everyone who sees it wants to touch it. Since the wood is very thin and it doesn’t have or need a frame, it took me a while to figure out how to hang it on the wall without putting nails or screws through it. My solution: a wood french cleat and liquid nails. First, I cut a 16-inch length and a 9-inch length from the 1X2 board. The longer piece would become the french cleat, the other would just add stability to the bottom of the art. To make the french cleat, I ripped (cut lengthwise) the 16-inch pieces at a 45-degree angle using a band saw. There are other types of saws you can use to cut at an angle, my band saw is just my favorite saw. 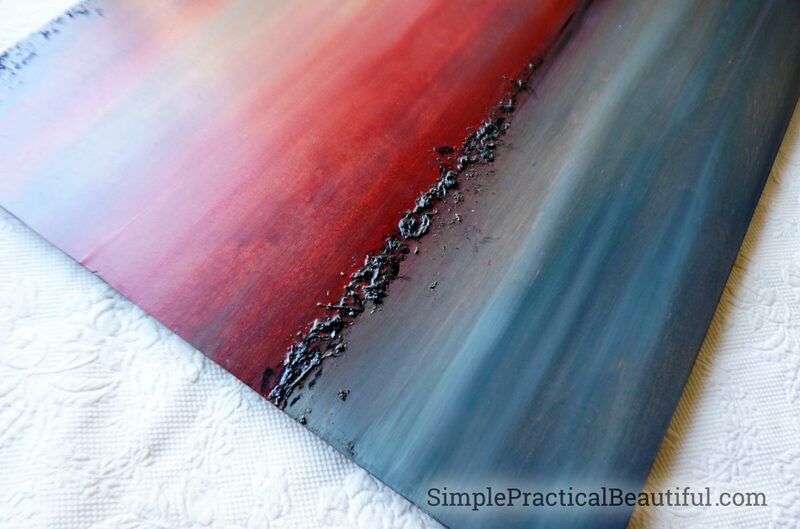 I glued the half of the ripped board onto the art piece with liquid nails. 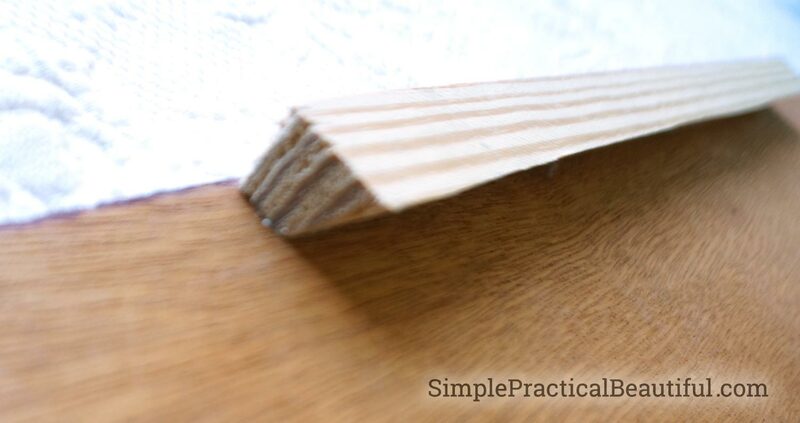 It’s very important that the smaller side of the wood is glued on, which feels very backward. I have to admit, that I held it up and tested it a few times to make sure I was gluing the right side. I needed the larger side of the board to stick out and hook on the other half of the board. Then I attached the other half of the board to the wall with screws and wall anchors. Again, it’s important that the small side of the board is attached to the wall. Now both boards (on the art and on the wall) will hook onto each other, holding the artwork securely in place. I countersank the screws into the wood, so they wouldn’t stick out into the art piece. Again, I think I tested it like five different times before I screwed it on just to be sure I was hanging it the right way. 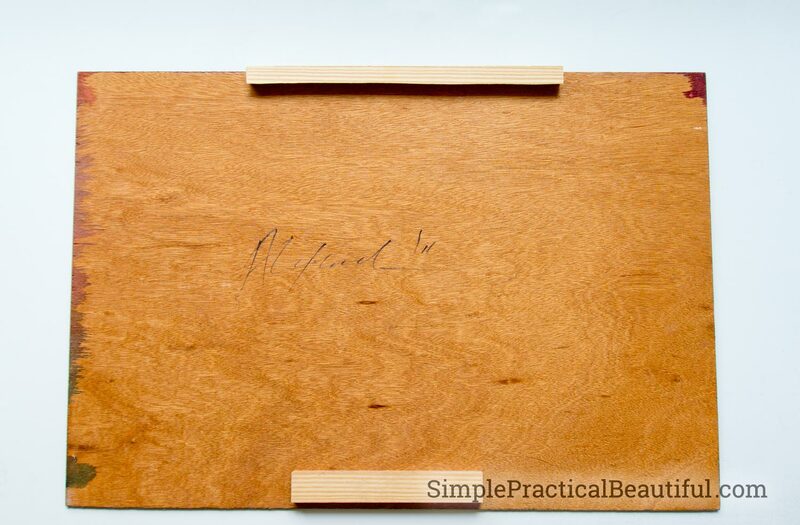 I used liquid nails to glue the 9-inch board onto the bottom back of the art piece. This was just to keep the bottom even with the top when it hangs. Just lower the art onto the board on the wall until the other side of the board catches. It’s much sturdier than a nail or even a screw with a wall anchor. The artwork will never hang crookedly. I love how this project turned out! 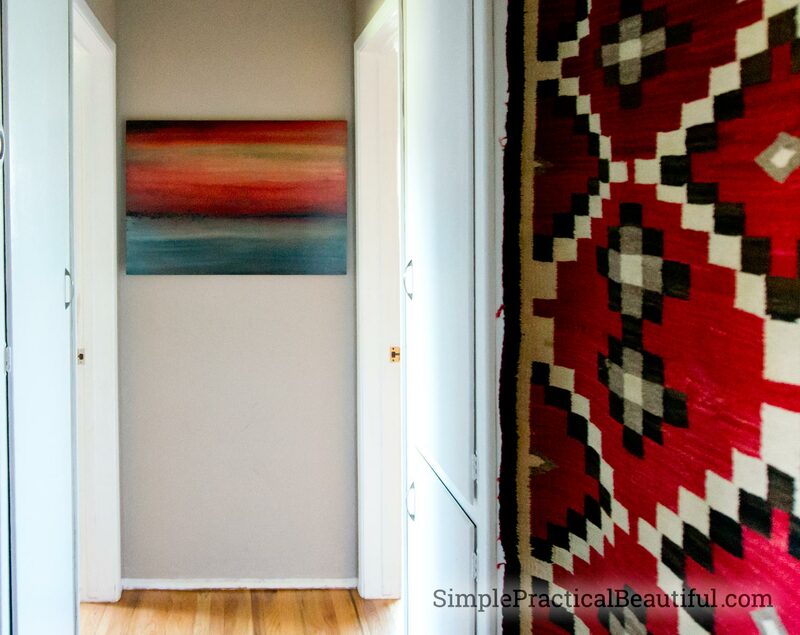 The horizontal lines of the painting make the hallway feel wider. Every time I walk down the hall I feel like I’m walking toward the ocean. I also love that the art piece coordinates with the red in our heirloom rug hanging on an adjacent wall. The only thing missing is good lighting for both the painting and the rug. I’ve added that to our house “to do” list. I was just thinking about using French cleats to hang something the other day, and I decided not to do it because I wasn’t sure if I was remembering it correctly! Thanks for all the tips, and for sharing with us at Dream. Create. Inspire. Link. Read your post and it is really well done. I like the piece of art you’ve chosen too. Just wanted to mention to your readers that French Cleats have come a long way over the centuries. They are now made from aluminum and are called z-clips. At MBS we make the most affordable systems for hanging art, signs and displays. I’m hoping to share it with your readers. Thank you, and thanks for the information. 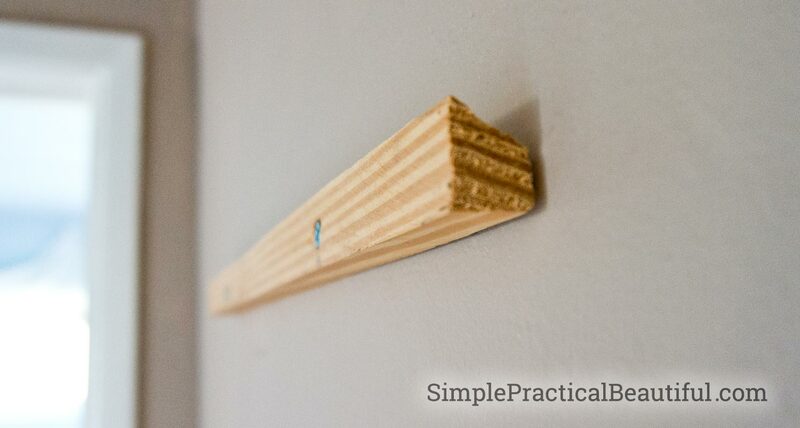 We intentionally used a wood french cleat for this piece so that it would hang about a half an inch away from the wall, but we’ve used aluminum hangers several times. 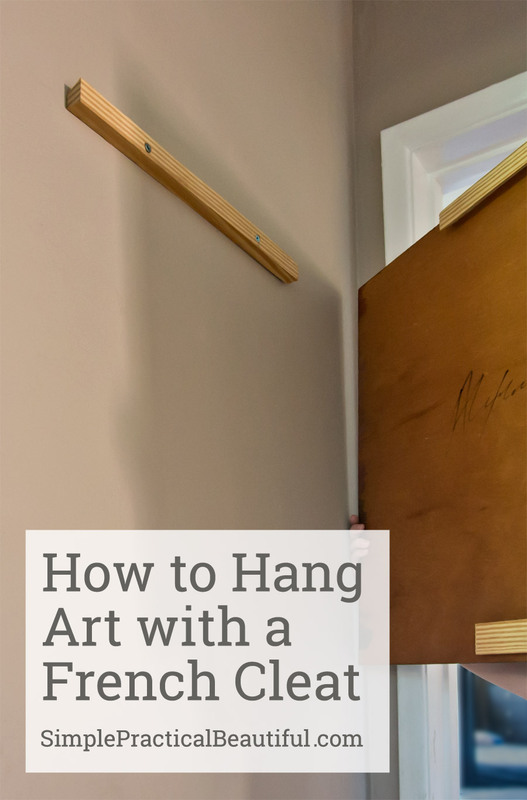 They are especially good for hanging mirrors and heavy frames because they are so sturdy.